This is from a recipe book I have. 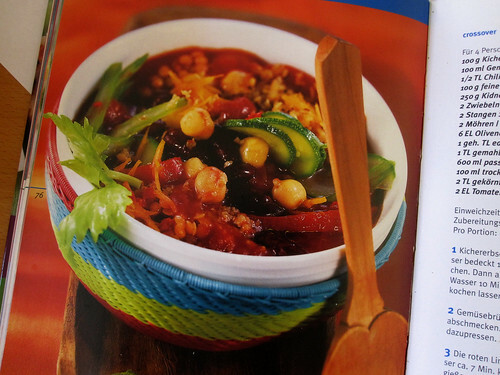 It is a vegetarian chili, and I make it very often. Since the recipe is in German, I am not reading it very carefully.. by now there are a lot of modification I made. I think the most important part is the combination of the spices..
1. Chop all the vegetables. Sizes and shapes are up to your preference. 2. Mix the spice mix in a bowl. 3. Take big pot and put it on oven top. Add some olive oil, chopped garlic and ginger. When you start to smell good garlic smell, add onion and cook it until it is transparent. 4. Add spice mix in the pan and stir it good. cook the spice for a while. 5. Add rest of the vegetables and stir. 6. Add canned tomato, beans (you can add the water in the can too), tomato paste, honey and wine. 7. Add some water so that there is enough liquid to cook (if it is already liquidy, you do not have to add water). Add vegetable soup stock. 8. Taste it and add salt and pepper as you like. 9. The timing of adding fresh chili depends on how “hot” you want to make. If you cut it, it will be more spicy as well. 11. Serve with rice, bread and sour cream or yogurt.